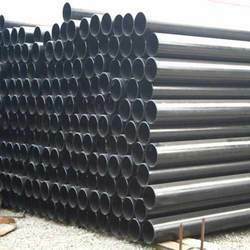 We are a leading Distributor of carbon steel seamless pipes from Hyderabad, India. We have in store a wide array of Carbon Steel Seamless Pipes. To ensure the higher level of patron satisfaction, we provide these seamless pipes in accordance with their given specifications. Further, to ensure the longer service life of offered seamless pipes, our vendors manufacture these utilizing premium quality raw material while keeping in mind the established quality standards. Looking for Carbon Steel Seamless Pipe ?